"Lady Salisbury and the Tiara"
There have been endless squabbles and "tracasseries"  about the tiara which was presented to the Princess of Wales by her "lady friends" . The amount subscribed was very much smaller than had been anticipated, for the sort of people who consider it expedient to take every opportunity of toadying to royal personages thought, as might have been expected, that it would "pay" better to present a separate personal gift, rather than to take part in a joint offering of which only the leaders would get the credit. The final dispute between Lady Salisbury  and "Lady A." was very funny; but, although the Prime Minister's spouse tries hard to be "très grande dame," she has hitherto failed dismally in this attempt, and, instead of playing the part of Lady Palmerston , her social business has positively damaged her husband, for, with a vast deal of fuss and bustle, she only makes herself ridiculous by her arrogant pretensions. 1. Cropped version of a photograph in the public domain due to age; source here. 2. The word loosely means "hassles" or "annoyances" in French. 3. 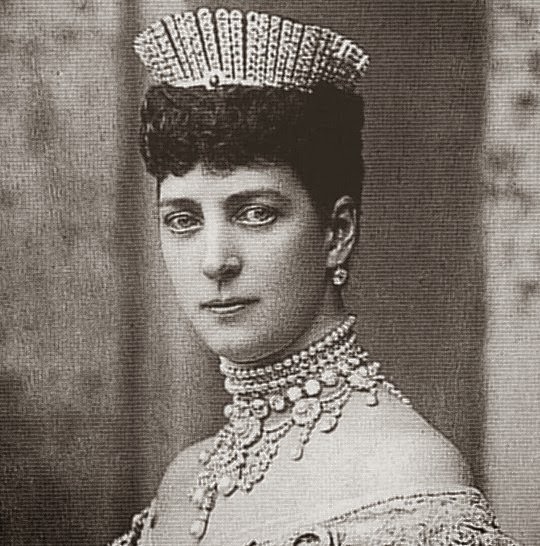 That tiara is Queen Alexandra's Kokoshnik Tiara, made by Garrard in the fashion of the Russian kokoshnik tiaras that were so popular at the imperial court of Alexandra's sister, Empress Marie Feodorovna of Russia. The tiara was given to the Princess of Wales as a silver wedding anniversary gift, by a committee of the "Ladies of Society." Alexandra wore the tiara to the wedding of her son, the future King George V, in 1893. 4. Georgina Gascoyne-Cecil, Marchioness of Salisbury (1827-1899) was the wife of the 3rd Marquess of Salisbury. He served as prime minister three separate times, including at the time of this article's publication. 5. Maria Brudenell-Bruce, Dowager Marchioness of Ailesbury. The other ladies heading the committee included Charlotte Spencer, Countess Spencer (wife of the 5th Earl Spencer) and Emily Boyle, Countess of Cork (wife of the 9th Earl of Cork). 6. Emily Temple, Viscountess Palmerston (1787-1869) was the wife of the 3rd Viscount Palmerston, who was twice prime minister during the nineteenth century; she was also the sister of another prime minister, Lord Melbourne. Emily is being held up here as the example of a perfect political wife.